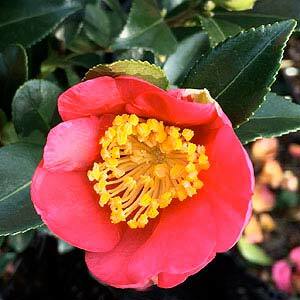 These are the sun loving camellias and Camellia Sasanqua make great specimen plants as well as hedges and potted plants. Although they are the best camellias for sun, they will perform much better if they are mulched so that the soil remains moist and the root run cool. In a very position or hot climate they are best protected from the afternoon sun. Prolific flowering from autumn through to winter make these a great addition to nearly any garden . 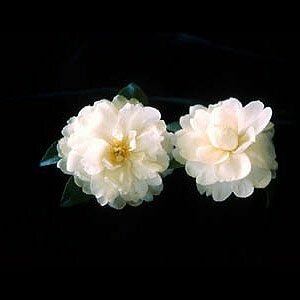 In general, Sasanquas are just as easy to care for as other camellias and the can be grown in full sun or in part shade. Camellia sasanqua ‘Mine-no-yuki’ (picture right) is a popular cultivar for hedges as well a specimen plant. Much loved in Japan and characterized by glossy dark green leaves these are another great garden plant. Reaching over 5m if left unpruned plants can easily be clipped back to make a formal hedge if required. Camellia Sasanqua are much more tolerant of sunny positions than Camellia Japonica. Again a well drained humus rich soil is best and they will cope with a little shade. A soil ph of 5.5 – 6.5 is best although they can handle a little either way. Remember that these are a shallow rooted plant, so mulch well to provide a cool root run. Choose a position with some protection from very hot afternoon sun and wind for best performance. Prepare the soil well with lots of organic matter before planting. Mulch around the plant well to maintain moisture. Fertilise each spring with a specilaist camellia fertiliser. C. sasanqua ‘Setsugekka’ with its shell pink flowers is a real favorite and can make a great hedge. This is an early flowering variety, autumn to winter, which also makes a great espalier plant. C. sasanqua ‘Mine-no-yuki’ is another much loved cultivar reaching a height of around 4m. Coping with more sun than their close relations Camellia sasanqua are indeed a versatile plant. Great as specimen plants, easy to prune and great hedging plants, a must for all but tropical gardens. As for most plants dig holes larger than the pot. Camellias can be staked to promote a more upright habit. Water in well and maintain a moist soil for the first few summers. Camellia sasaqua require little care once established, prune to shape and fertilise once a year. A specialist camellia fertilizer once a year is usually adequate. Remember that like all camellias they prefer a slightly acidic soil, no lime please. Easy to keep in shape with light pruning after flowering in late spring to early summer. They can also be espaliered or pruned to a hedge. As a hedging plant Sasanquas are excellent, they will take a while to bush out and form a dense hedge. As they have smaller leaves than other camellias they prune a little more tidily. As for spacing, the planting distance will depend on the density of the hedge required and the actual variety, in general plant then at around 70cm – 1m apart.